The large, multisite California-based study examined associations between specific classes of pesticides, including organophosphates, pyrethroids and carbamates, applied during the study participants' pregnancies and later diagnoses of autism and developmental delay in their offspring. It is published online in Environmental Health Perspectives. "... the message is very clear: Women who are pregnant should take special care to avoid contact with agricultural chemicals whenever possible." The study was conducted by examining commercial pesticide application using the California Pesticide Use Report and linking the data to the residential addresses of approximately 1,000 participants in the Northern California-based Childhood Risk of Autism from Genetics and the Environment (CHARGE) Study. The study includes families with children between 2 and 5 diagnosed with autism or developmental delay or with typical development. "We mapped where our study participants' lived during pregnancy and around the time of birth. In California, pesticide applicators must report what they're applying, where they're applying it, dates when the applications were made and how much was applied," Hertz-Picciotto said. "What we saw were several classes of pesticides more commonly applied near residences of mothers whose children developed autism or had delayed cognitive or other skills." People with Type 2 diabetes or obesity have changes in the composition of their intestinal micro-organisms -- called the gut microbiota -- that healthy people do not have, researchers from Turkey have found. The human digestive system contains an estimated 10 trillion to 100 trillion bacteria and other microscopic organisms, with each person housing at least 160 different species of organisms, according to Basaran. Basaran and his fellow researchers sought to identify the relationship between the gut microbe composition and obesity and Type 2 diabetes. Their study included 27 severely obese adults (20 men and seven women) whose body mass index, or BMI, exceeded 35 kg/m2, as well as 26 adults (18 men and eight women) with newly diagnosed Type 2 diabetes and 28 healthy control subjects (22 men and six women). "Manipulation of intestinal bacteria could offer a new approach to manage obesity and Type 2 diabetes." 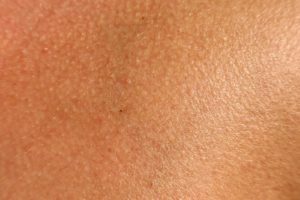 People who get bitten by a blacklegged tick have a higher-than-expected chance of being exposed to more than one pathogen at the same time. "We found that ticks are almost twice as likely to be infected with two pathogens -- the bacterium that causes Lyme disease and the protozoan that causes babesiosis -- than we would have expected," said Felicia Keesing, a professor of biology at Bard College, Adjunct Scientist at the Cary Institute, and co-author of the paper. "That means health care providers and the public need to be particularly alert to the possibility of multiple infections coming from the same tick bite." Not only was co-infection with the agents of Lyme disease and babesiosis greater than expected, but rates of triple infection with the agents of Lyme, babesiosis, and anaplasmosis were about twice as likely as expected. "People in tick-infested parts of the United States such as the Northeast, Mid-Atlantic, and Upper Midwest, are vulnerable to being exposed to two or three diseases from a single tick bite," said Keesing. "And, of course, that risk increases when they're bitten by more than one tick." Because the N. eutropha are alive, he said, they would need to be kept cold to remain stable. I would be required to mist my face, scalp and body with bacteria twice a day. I would be swabbed every week at a lab, and the samples would be analyzed to detect changes in my invisible microbial community. While most microbiome studies have focused on the health implications of what’s found deep in the gut, companies like AOBiome are interested in how we can manipulate the hidden universe of organisms (bacteria, viruses and fungi) teeming throughout our glands, hair follicles and epidermis. They see long-term medical possibilities in the idea of adding skin bacteria instead of vanquishing them with antibacterials — the potential to change how we diagnose and treat serious skin ailments. For my part in the AO+ study, I wanted to see what the bacteria could do quickly, and I wanted to cut down on variables, so I decided to sacrifice my own soaps, shampoo and deodorant while participating. I was determined to grow a garden of my own. Some skin bacteria species double every 20 minutes; ammonia-oxidizing bacteria are much slower, doubling only every 10 hours. And now the bacteria were on my skin. AOBiome is not the first company to try to leverage emerging discoveries about the skin microbiome into topical products. The skin-care aisle at my drugstore had a moisturizer with a “probiotic complex,” which contains an extract of Lactobacillus, species unknown. There is even a “frozen yogurt” body cleanser whose second ingredient is sodium lauryl sulfate, a potent detergent, so you can remove your healthy bacteria just as fast as you can grow them. Although a few studies have shown that Lactobacillus may reduce symptoms of eczema when taken orally, it does not live on the skin with any abundance, making it “a curious place to start for a skin probiotic,” said Michael Fischbach, a microbiologist at the University of California, San Francisco. Extracts are not alive, so they won’t be colonizing anything. I asked AOBiome which of my products was the biggest threat to the “good” bacteria on my skin. The answer was equivocal: Sodium lauryl sulfate, the first ingredient in many shampoos, may be the deadliest to N. eutropha, but nearly all common liquid cleansers remove at least some of the bacteria. Antibacterial soaps are most likely the worst culprits, but even soaps made with only vegetable oils or animal fats strip the skin of AOB. People with diets higher in protein, especially from fish, may be less likely to have a stroke than those with diets lower in protein, according to a meta-analysis. The meta-analysis looked at all of the available research on the relationship between protein in the diet and the risk of stroke. Seven studies with a total of 254,489 participants who were followed for an average of 14 years were included in the analysis. "The amount of protein that led to the reduced risk was moderate -- equal to 20 grams per day," said study author Xinfeng Liu, MD, PhD, of Nanjing University School of Medicine in Nanjing, China. Overall, the participants with the highest amount of protein in their diets were 20 percent less likely to develop a stroke than those with the lowest amount of protein in their diets. The results accounted for other factors that could affect the risk of stroke, such as smoking and high cholesterol. For every additional 20 grams per day of protein that people ate, their risk of stroke decreased by 26 percent. Liu noted that the analysis does not support increased consumption of red meat, which has been associated with increased stroke risk. Two of the studies were conducted in Japan, where people eat less red meat than westerners do and more fish, which has been associated with decreased risk of stroke. The reduced risk of stroke was stronger for animal protein than vegetable protein. Protein has the effect of lowering blood pressure, which may play a role in reducing stroke risk, Liu said. Researchers at the University of California, San Diego School of Medicine have found that persons with lower blood levels of vitamin D were twice as likely to die prematurely as people with higher blood levels of vitamin D.
The finding, published in the June 12 issue of American Journal of Public Health, was based on a systematic review of 32 previous studies that included analyses of vitamin D, blood levels and human mortality rates. The specific variant of vitamin D assessed was 25-hydroxyvitamin D, the primary form found in blood. This new finding is based on the association of low vitamin D with risk of premature death from all causes, not just bone diseases." Garland said the blood level amount of vitamin D associated with about half of the death rate was 30 ng/ml. He noted that two-thirds of the U.S. population has an estimated blood vitamin D level below 30 ng/ml. "This study should give the medical community and public substantial reassurance that vitamin D is safe when used in appropriate doses up to 4,000 International Units (IU) per day," said Heather Hofflich, DO, professor in the UC San Diego School of Medicine's Department of Medicine. The average age when the blood was drawn in this study was 55 years; the average length of follow-up was nine years. The study included residents of 14 countries, including the United States, and data from 566,583 participants. Bacteria Involved in Stress Triggered Heart Attacks? Scientists believe they have an explanation for the axiom that stress, emotional shock, or overexertion may trigger heart attacks in vulnerable people. Hormones released during these events appear to cause bacterial biofilms on arterial walls to disperse, allowing plaque deposits to rupture into the bloodstream, according to research published in published in mBio®, the online open-access journal of the American Society for Microbiology. "Our hypothesis fitted with the observation that heart attack and stroke often occur following an event where elevated levels of catecholamine hormones are released into the blood and tissues, such as occurs during sudden emotional shock or stress, sudden exertion or over-exertion" said David Davies of Binghamton University, Binghamton, New York, an author on the study. In normal conditions, biofilms are adherent microbial communities that are resistant to antibiotic treatment and clearance by the immune system. However, upon receiving a molecular signal, biofilms undergo dispersion, releasing enzymes to digest the scaffolding that maintains the bacteria within the biofilm. These enzymes have the potential to digest the nearby tissues that prevent the arterial plaque deposit from rupturing into the bloodstream. According to Davies, this could provide a scientific explanation for the long-held belief that heart attacks can be triggered by a stress, a sudden shock, or overexertion. To test this theory they added norepinephrine, at a level that would be found in the body following stress or exertion, to biofilms formed on the inner walls of silicone tubing. "At least one species of bacteria -- Pseudomonas aeruginosa -- commonly associated with carotid arteries in our studies, was able to undergo a biofilm dispersion response when exposed to norepinephrine, a hormone responsible for the fight-or-flight response in humans," said Davies. Because the biofilms are closely bound to arterial plaques, the dispersal of a biofilm could cause the sudden release of the surrounding arterial plaque, triggering a heart attack. 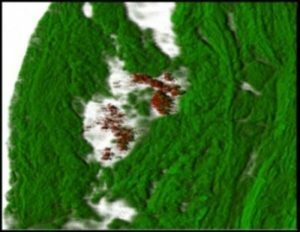 Bacteria stained with a fluorescent bacterial DNA probe show up as red biofilm microcolonies within the green tissues of a diseased carotid arterial wall.